We, Joe & Agnes, along with our family, have been in the self-catering and B&B business for many years over several decades and enjoy nothing more than showcasing our home to new and returning visitors from all parts of the world. Over the years we have taken great pride in renovating and upgrading our property to a high standard gaining a four-star classification. We have been fortunate to receive many awards of excellence from associations such as Fáilte Ireland, Georgina Campbell Guide, British Home Stores and Agri-Tourism awards, to name but a few. Our dog Shep, our cats, donkeys and hens are very much part of our welcoming committee. I have been staying in this farmhouse accommodation with my wife and cousin for the past 23 years in the month of June every year for atleast a minimum period of10 to 14 days and consider the place a home away from my home in Canada. The owner and her husband consider us as part of their family and the hospitality, affection we receive from the time we arrive till we leave is exemplary. Initially we used their B&B facility which was superb but later moved to their self-catering accommodation consisting of three bedrooms with three bathrooms. The accommodation is well maintained with clean linen,towels, cooking utensils, electric kitchen gadgets and cleaning materials etc. There are two pubs very close to the cottage and grocery shopping is not that far from the cottage. The famous Bantry town and Durrus on the way are with in 20 kilometers from the cottage. The owner provides broadband facility for internet users. We like the serene and peaceful atmosphere and take early morning walks by the road adjacent to Dunmanus Bay going towards Sheepshead. 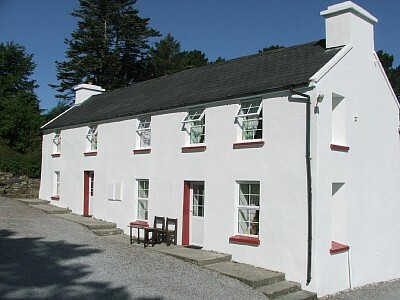 This place and accommodation are ideal for nature lovers and could be used as accommodation by those who want to tour the county cork and county kerry which can be covered as day trips. We go every day to Bantry town to do our banking and grocery shopping. More than all the above the personal touch the owners give us makes us come back every year to spend a peaceful time at the cottage. I can recommend this place as the best accommodation available in the Sheepshead peninsula of Cork County. My family and I have stayed at Hillcrest Farm several times over the last few years. We have stayed on a bed and breakfast basis and also self catering. We have stayed in the apartment which is the front part of the original farmhouse and have also stayed in the nearby detached bungalow. The accommodation is first class, being well maintained, spotlessly clean and comfortable and there is plentiful car-parking space at both sites. All modern domestic equipment is available and both the main house and bungalow are centrally heated. We usually stay in April and October, and we really appreciate the electric blankets on the beds. We particularly like to stay in the bungalow because the views across Dunmanus bay from the sitting room are spectacular. The garden has a swing and is ideal for children, and in the adjoining field are two friendly rescue donkeys, which enjoy being hand fed with carrots. Shep the sheepdog also likes a biscuit or two. The Sheep’s Head peninsular is rich in history and there are many ancient sites and buildings to explore. There are numerous small coves and stone jetties down narrow lanes and the drive across the mountains to the other side of the peninsular is lovely. Very near the farm is a pre-historic stone circle which is just visible from the bungalow. 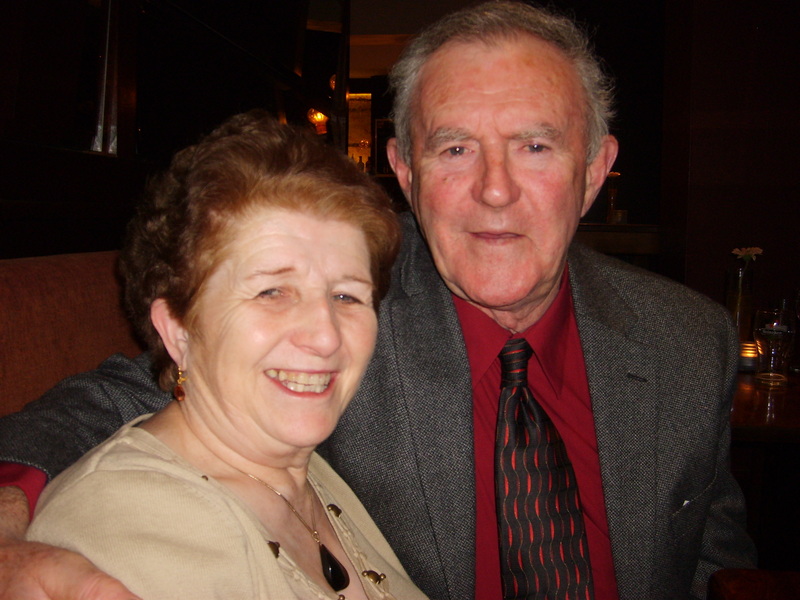 The owners Joe and Agnes Hegarty are very knowledgeable about the area and will always recommend local gardens to visit, places of interest to see and the best places to get a good meal. They have books, leaflets and maps of the area, and a particularly interesting book with a map of the waymarked Sheep’s Head walking route, which goes past Hillcrest Farm. Agnes and Joe are always very friendly and welcoming and we have had no hesitation in recommending Hillcrest Farm to our friends and relatives. We had a lovely time in Hillcrest House and the Ahakista area, helped by great weather. Agnes & her family were very welcoming and our kids enjoyed the donkeys, chickens, cat and especially Shep the dog. We had a toddler and a teenager, and hadn’t been to Sheeps Head for 20 years. Agnes even delivered some mackerel straight off the boat – which was appreciated by the fish lovers. House is private and spacious, ample parking, great patio and garden area, swings for the kids. Very quiet area, great for walking, swimming, fishing, cycling, touring. House very clean and well maintained, we had no problems. Local village with small safe beach, pub 10 mins walk, shop 15 mins drive. We enjoyed the local maritime festival. The penninsula is not as busy as Mizen or Beara, so the roads are quiet, non Irish drivers should be careful on the narrow roads, the locals tend to drive fast. As you are on a penninsula, expect to drive up to an hour if you want to partake in activities/sightseeing or shopping outside of the Sheeps Head. Activities – visit Bernies tea room at Sheeps Head, Bantry House, Mizen Head visitor Centre, Barley Cove Beach, Schull, Glengarriff & Garnish Island, Gougane Barra, Skibereen & Baltimore & the islands, Adrigole watersports centre (kayaking, sailing etc). Drive on the Goats Path road, crab fishing off the pier, prehistoric stone circle 10 mins walk. Good food in Durrus – try the Long Boat & Sheeps Head. All in all, just what we expected – a warm friendly welcome, clean spacious house with all facilities, safe quiet area, ideal for families with young children or people looking for peace & quiet by the sea with a warm Irish welcome. Would return to Hillcrest House. We have been spending summers in Ahakista for many years and this is the most perfect house. The owners are a delightful couple and live close by, ready to help with any enquiries. The house is completely private, has a beautiful garden with stunning views over Dunmanus Bay and the recent construction of a lovely patio area makes morning coffee and drinks in the evening a real pleasure. The house is equipped with every creature comfort but retains the charm only found in older properties. Two of the three bedrooms are en suite and there is, in addition, a large family bathroom. The sitting room is cavernous, beautifully furnished and there is a large fireplace to relax in front of, once you have lit a roaring peat fire, for when the weather is cooler. The kitchen is well equipped and there is a large dining area with high quality furniture. There is also a useful, separate utility room, ideal for people with families, needing laundry facilities most days. The village of Ahakista is a gem – so beautiful, with its own secluded swimming beach, unknown to most people who drive along the peninsula. There are two pubs, two coffee shops, and there is a busy pier where it’s fun to watch the fishermen bring in their daily catch. Within just a few minutes are the neighbouring villages of Durrus and Kilcrohane, with stores, restaurants, pubs and post offices. Kilcrohane has a pier, off which you can jump, and the water is perfect for safe swimming. The Sheep’s Head Way runs just behind the farmhouse and the views from the top of the fells are breathtaking. There are also numerous “loop” walks in the area, both in the hills and on the cliff tops. Further afield, but within an hour and along the most scenic drives imaginable, are the beaches of Ballyrissult and Barley Cove. 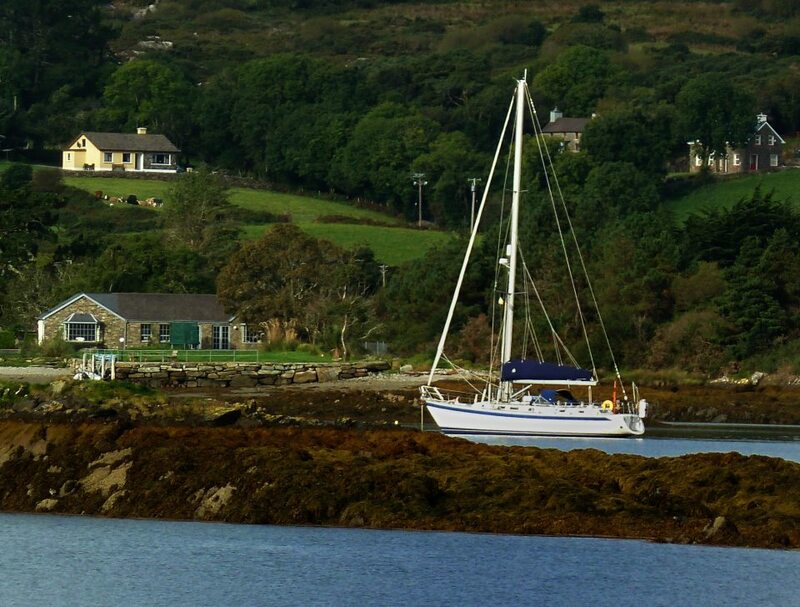 Schull and Bantry are the nearest towns and are lovely places to while away a few hours. Bantry has a cinema, a weekly Friday market, some excellent places to eat and pubs full of character. Schull is boaty, bustling and from there you can take the ferry over to Cape Clear Island and the Fastnet rock – two real treats. We stayed at Hillcrest for a week and had a really great holiday, due in large part to the hospitality and hard work of Agnes and Joe. The house is really well-equipped, so there is no need to bring any household items or equipment with you. As we benefitted from great weather during our stay, we used the patio area for our meals, with lovely views over the bay. For relief from the heat, we made use of the shade provided by the trees in the lovely private garden. We enjoyed a couple of trips to the Ahakista Bar (the Tin Pub), with its own garden overlooking the sea and a couple of meals in Arundel’s, at the quayside. The nearby Heron Gallery serves lovely meals, beautifully presented and using fresh local produce. The Sheep’s Head Way passes right outside the house and we walked a couple of the looped trails, which are clearly marked and easy to follow. Also recommended is a trip to the end of the peninsula (take care on the very narrow roads!) and the walk to the lighthouse. We also drove to Mizen Head visitor centre, stopping off at the beautiful Barley Cove beach. On the far side Bantry, but still within easy reach, is the village of Glengarriff, where you can take a ferry to Garinish Island and spend a couple of hours exploring the Italian-style gardens. Agnes and Joe are very helpful in providing all the help and advice you need, and we really enjoyed regular visits from their lovely dog, Shep, who was a firm favourite with our two teenagers! I did not want to leave!! Out of the four weeks spent in Ireland, we spent 7 of those days at Hillcrest Farm in Ahakista. We did not rent a car and took a taxi from Bantry to the farm. Upon arrival we were greeted by Agnes with a plate of scones she had backed that day! The farm is located on a hill top that looks out of the bay and mountains. It is also located on what they call “Sheeps head way”, a fantastic hiking trail that spans around a stone ring, through woods, over hills, past ruins- including a small castle, seaside cliffs, and even a horse pasture! The house and grounds were beautiful, obviously a work of love for Joe and Agnes. Both were very friendly and helpful. We truly felt welcome and part of the family. You could not find more friendly people if you try. The restaurant in town was excellent although a little pricey. A walk to the next nearest town gave us a few more options as well as a little shop. Everybody (and I do mean everybody) was incredibly nice, helpful, and seemed genuinely glad to have you! I hope to come back and spend much longer very soon! Thank you, Joe and Agnes!! Hillcrest farm is beautifully situated between the sea and the mountains. The house is really clean and spacious. We enjoyed having a fireplace in the living room. The outside terrace is sunny and sheltered from the wind. Agnes and Joe were very kind and they were happy to answer all the questions we had about the house and the surroundings. highest compliment available- we booked for next year before we left. great central location for sheepshead peninsula and all of southeast ireland. best equipped kitchen we’ve ever experienced. wonderful views. best hosts anyone could ask for. Excellent location, gorgeous views and wonderful hosts!-David E.
We decided to have an family reunion in Ireland a decade after selling our home on the Seven Heads Peninula (between Clonakilty and Kinsale). We selected Hillcrest Farm after an extensive search. It was an excellent choice. It is exceptionally well-maintained, fully-equipped, very comfortable and quite spacious — with three bedrooms upstairs and a large country-style kitchen and an even larger dining room/living room downstairs. The farmhouse is very private and has stunning views overlooking the quaint cove in Ahakista filled with boats. It reminded us of Glandore, which we regularly visited in the past. The farmhouse was wonderful for our almost two-year-old granddaughter, who enjoyed the safe space for supervised play, the swings, and all the farm animals — Shep the dog, the two friendly donkeys (that love apples and carrots), the chickens and the cows. Agnes and Joe were great hosts, supplying us with home-baked scones on arrival and fresh farmhouse eggs during our stay. Agnes also recommended local places to eat — Arundel’s Restaurant and Bar a short distance away, which has great food and outdoor seating overlooking the cove, and Blair’s Cove outside Durrus, one of the Southwest’s best restaurants, where my wife and daughters enjoyed an unparalleled dinner (I babysat) — and places to visit, including two excellent gardens (Heron’s Gallery and Cafe in Ahakista and the spectacular river-side Wiseman Garden on the edge of Durrus). In sum, we had a wonderful stay with wonderful hosts and stunning views in an unspoilt area of West Cork. We hope to visit again someday and will recommend Hillcrest Farm to all our friends! Our third summer staying at Hillcrest Farm-Aidan P.
This is a beautiful place to stay, the location could not be better. We have stayed in Ahakista for the past four summers, the last three at Hillcrest Farm as we really can’t find anywhere better. If you like peace and quiet then you will definitely find it here. The view, which can be enjoyed from the patio, overlooks Dunmanus Bay and is beautiful. There is a lovely, mature garden, full of character, trees and shrubs everywhere plus a really useful washing line! Also plenty of parking space. The house is comfortable and well equipped, clean and well maintained with plenty of useful kitchen items like cling film, food bags and bin bags. There is plenty to do on Sheeps Head alone. Our particular favourites are Ahakista beach and The Tin Pub, Kilcrohane Pier where the children love jumping into the sea, The Heron Gallery for lovely food and beautiful art, and walking out to the lighthouse at the end of the peninsula. We are also able to bring our little dog here, and she loves it just as much as we do, making friends with Shep and some of the other local dogs! Thanks again to Agnes and Joe for welcoming us to their lovely piece of paradise. We were 4 adults travelling throughout Ireland, and used this wonderful, spacious and clean farmhouse as a base for our exploring of Southern Ireland. The views are spectacular, and the countryside is everything we hoped Ireland would be. Agnes, our host, was very helpful and informative, and provided us with fresh scones and preserves upon our arrival. Our stay at the Hillcrest Farmhouse couldn’t have been better !